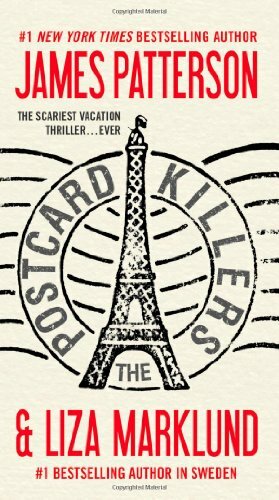 The Postcard Killers by James Patterson and Liza Marklund is not a typical thriller. The riveting prologue sets the stage for promises the book is quick to deliver. Patterson’s penchant for unusually short chapters, which read more like scenes, propels the story forward with precision and expert pacing. Most serial killings have a distinctive pattern. So it is with this atypical story, one that baffles police all across Europe, including NYPD policeman, Jacob Kannon. Kannon’s interest is personal. The love of his life, his daughter, Kimmy, and her newlywed husband, are among the slaughtered victims. Catching the killer is the only thing keeping Kannon from blowing his brains out to put an end to his intense grief. None of the cities in the wide array of European countries will accept the American policeman’s help in solving these crimes—except for Stockholm, Sweden. Reporter Dessie Larsson gets the usual postcard, followed by grotesque Polaroid pictures of the first victims in Sweden. While Swedish investigators, Mats Duvall and Gabriella Oscarsson—the latter Dessie’s former lover—are not happy about it, they realize they need all the help they can get. Jacob has a strong sense that the case will be solved and presses Dessie to answer the postcard, offering the senders a huge sum of money for an interview. Dessie, hesitant, agrees, only if the often drunk and hung over Kannon will shower, shave, and change his clothing—but even through the filth she finds herself mesmerized by his sapphire-blue eyes and thick dark hair. To her horror, two more victims are found dead, posed much like all the rest, and Dessie feels responsible. Yet, in this and ensuing murders, something is different—not quite right. On a positive note, the killers, now presumed to be two people, are getting careless and are caught on camera at one of the crime scenes: a dark-haired woman and a fair-haired man. Patterson’s serial killers are like none ever known and just when the reader thinks the plot is headed one way, he throws a curve ball, sending the story off in new and different directions, aided by the deftly subtle Marklund, who adds her own feminine and European expertise to the writing. Sylvia and Mac, lovers and twins, are brazen enough to turn themselves over to the police and do interviews, to prove that, in spite of the resemblance, they are innocent. It’s difficult to believe these charming siblings are capable of the carnage done to the victims. And they are set free. Patterson, whose writing is reminiscent of Hemingway’s in its sophistry, occasionally inserts foreign sentences into the book, not always decipherable by the reader, but not enough to disrupt the flow of the story. Most times, but laboriously, the translation can be figured out by the content of the situation. The writing, generally fast-moving and entertaining, has some sentences that don’t make sense or offer appropriate imagery. But the only true flaw to this book is that it has to come to an end. James Patterson, teamed with widely acclaimed writer, Liza Marklund, is likely to catapult this novel into his best received yet. Micki Peluso is a journalist for three major newspapers, a short story writer, and author of . . . And The Whippoorwill Sang, a humorous family memoir.